more lined skirts – I’m lining all my skirts, but have plans to make unlined skirts for the summer soon. a tailored shirt – I made the camp shirt for Thor which had some tailoring, but have not yet attempted one for myself. participate in at least 1 Pattern Review contest – maybe the LBD contest??? make at least 25 garments (one of which should be a complex pattern like the trench coat) – I’ve made 13 garments so far this year. Yippee!!!! With my sister’s “lemonade” skirt to be completed this week, I am on track for completing 25 garments by the end of the year. I can’t believe it almost. I really want to make a sheath dress for my cousin’s wedding this summer but am still dithering about which pattern to use. The blazer/jacket will be taken care of in the Trench Sew Along II; I am making a fall coat out of some purple wool I bought last year. I am dying to make cardigans, so hopefully that will get knocked off the list. And as you all know, I am really trying to find some TNT patterns for my work wardrobe, so I hope to definitely accomplish that this year. So, all in all, I think I am doing ok with my plans for the rest of the year. This list was a wish list. If I don’t get to everything, so be it. I’m not going to whine about it later. Ok, maybe I will but it won’t last long I promise. 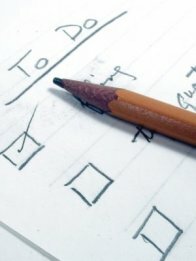 Anyhoo, how are you doing with your goals for the year (if you had any)? Tell me! This entry was posted in Beginner, End of Year Recap, Question of the Day, Sewing. Bookmark the permalink. Way to go, Sweetie. That is quite a wish list! You are much more ambitious than I am. I am starting on Chloe’s quilt tomorrow and hope to have it cut up before leaving for the Kelley wedding in Santa Barbara next week. Did you like the material? Great progress on your list so far! The theme of my goals for 2010 were to try new things, which I have certainly done so far, with my first pair of trousers completed a while back, my first go at ‘slippery’ material and my current project being a winter coat. Most of all I wanted to take my time and enjoy the process, which I’ve certainly been doing. Well thats quite a list, don’t feel bad if you don’t get to absolutely everything on it. I didn’t set any goals this year although I did list out all the PR contests I might be interested in doing. Managed 1 so far! Awesome! I can’t wait to see your tailored blouse!!! Wow Elizabeth – that’s quite a list of goals! Kudos to you though as I look forward to seeing all your creations! That is an impressive list! My only real goal was to actually sew garments I would wear (as opposed to costume stuff that would languish unused in the closet for years on end). I guess I’ve been somewhat successful in that I’m wearing my Jalie jean capris right now and wore a self-made blouse yesterday… now if I can just conquer my fear of knits. And get my production quality up a little higher. I want to take my time and feel precise and confident about what I’m doing at any given point, but if I’m not paying attention I tend to backslide into just whipping it out… and then (surprise!) I’m not happy with the result. Hey, that’s a great list, Elizabeth! Your very, very ambitious, so try not to let The List have too much importance moving forward. You ARE moving forward, after all! Go you! My Big, Ambitious Goal this year is to complete my long houndstooth coat (based on Simplicity 2812). It’s been cut out and ready to go for over 1-1/2 years, and there are so many “new” skills for me to acquire to complete it. I’ll be making Spanish snap buttonholes, making my own piping and putting in a lining (this is the part I dread MOST). It’s all part of the process, tho! I’m hitting up the Jalie jeans pattern next year. And possibly FINALLY make a swimsuit (this will be attempt #3). That’s going to be challenging, too. Wow. I’m so bad at setting goals. And often end up making something (or many things) else. But I’m going to make that coat! Yes I am! What a great list of goals!I don’t think we were reading each other’s blogs yet at the beginning of the year, so I missed them when originally posted. I think you’re doing fine with them – it is only June. You’ve inspired me to dust off my list of goals and post about my progress. Your blog is one of the few that really inspire me to action! My main goals were to make 3 major pieces in my wardrobe by the following year. So far, nada. The coat from the sew-along should be one, for sure! I think you are doing great…it’s only June and you still have 6 months to go and at the rate you are progressing, you will cross a few more things off your list. Now about those TNTs, you know it took me years to get them perfected, right? You are doing awesome on your goals! I didn’t set any, I don’t think. Just sewing and trying to buy less fabric. You are making great progress on your goals! I should try this, as I tend to make things on a whim that I don’t really need, or they don’t match anything and I need to make something else to wear it!